Joshua Sidney Henshaw7 [Joshua Henshaw Belcher7]. Born Oct 16 18117,8 [about 18155, 18199], Boston, Suffolk County, Massachusetts7,8. He married Jane Handy, Mar 11 1846, Utica, Oneida County, New York.1 Marriage performed by Rev. George Leeds.1 Marriage reported on Mar 13 1846 in the "Utica Daily Gazette".1,4 Jane, daughter of John H. Handy1,3,5, was born about 18201,3,5 [about 18306], New York1,3,5. Abigail Handy, age 64, born in Massachusetts; $36,000 real estate. Joshua S. Henshaw, age 35, born in Massachusetts; lawyer. Jane Henshaw, age 30, born in New York. John H. Henshaw, age 6 months, born in New York. Elizabeth Floyd, age 16, born in Ireland. Bridget Floyd, age 20, born in Ireland. Abigail Handy, age 73, born in New York; $25,000 real estate; $2,000 personal property. Jane Henshaw, age 40, born in New York. John Henshaw, age 10, born in New York; attended school. Abby Henshaw, age 9, born in New York; attended school. Margaret Lynch, age 20, born in Ireland; domestic. Henshaw, Jane, age 50, born in New York; parents born in New York; widow; keeping house. Henshaw, Abbigal, daughter, age 30, born in New York; parents born in New York; single. HENSHAW, Joshua Sidney, author, was born in Boston, Mass., Oct. 16, 1811; a descendant of Jonathan Belcher, colonial governor of Massachusetts. His name, originally Joshua Henshaw Belcher, was changed by an act of the Pennsylvania legisltare in 1845. He was educated in the Boston schools, was a teacher in the Chauncy Hall school, Boston, 1833-37, and instructor in mathematics in the U.S. navy, 1837-41, and 1843-48. In 1838-40 he made a voyage around the world on the frigate Columbia. He was admitted to the bar in 1842 and practised in Utica, 1848-59. He published: Philosophy of Human [p.217] Progress (1835); Incitemeut to Moral and Intellectual Well-Doing (1836); Around the World, by an Officer of the U.S. Navy (2 vols., 1840); Life of Father Mathew (1849); and United States Manual for Consuls (1849). He died in Utica, N.Y., April 29, 1859. HENSHAW, JOSHUA SIDNEY, lawyer, author, was born Oct. 16, 1811, in Boston, Mass. He was a lawyer in Utica from 1848, but previously an instructor in the United States navy. He was the author of Incitements to Well Doing; Life of Father Mathew; United States Manual for Consuls; Around the World; and Philosophy of Human Progress. He died April 29, 1859, in Utica, N.Y. The original name of the Henshaws was Belcher, descended from Gregory Belcher, who came to New England in 1637 and settled in Braintree. He is tentatively identified with the Gregory Belcher, baptized 30 March 1606, son of Gregory Belcher, yeoman, of Berkeswell, Co. Warwick. In a 1665 deposition the immigrant said he was about 60 years old, which would place his birth in or about 1605, close to the baptismal date. His fourth great-grandson, Joshua Henshaw Belcher (1811-59), when a professor of mathematics at the Naval School in Philadelphia in 1846, petitioned the General Assembly of Pennsylvania to change his name to Joshua Sidney Henshaw. As the original petition was lost in the 1897 fire which destroyed the State Capitol at Harrisburg, the reason for the change remains unknown. It was probably to perpetuate the name of his childless great-uncle by marriage, Joshua Henshaw (1746-1823). 10,000 Vital Records of Central New York, 1813-1850; http://www.ancestry.com. parish register of Grace Church, Utica, New York; 1:15 (affidavit signed 30 apr 1921 by Rev. Octavius Applgate, Rector of Grace Church). 1860 census, 3rd Ward, Utica, Oneida County, New York; roll M653-827, page 258, line #20, dwelling #485, family #545. Contribution from Nancy Jacobsen (). 1850 census, 3rd Ward, Utica, Oneida County, New York; roll M432-563, page 317B, line #26, dwelling #92, family #110. 1880 census, Utica, Oneida County, New York; roll T9-0904, page 79B, line #45, dwelling #228, family #281. Johnson, Rossiter, ed. ; The Biographical Society, 1904; http://www.ancestry.com. 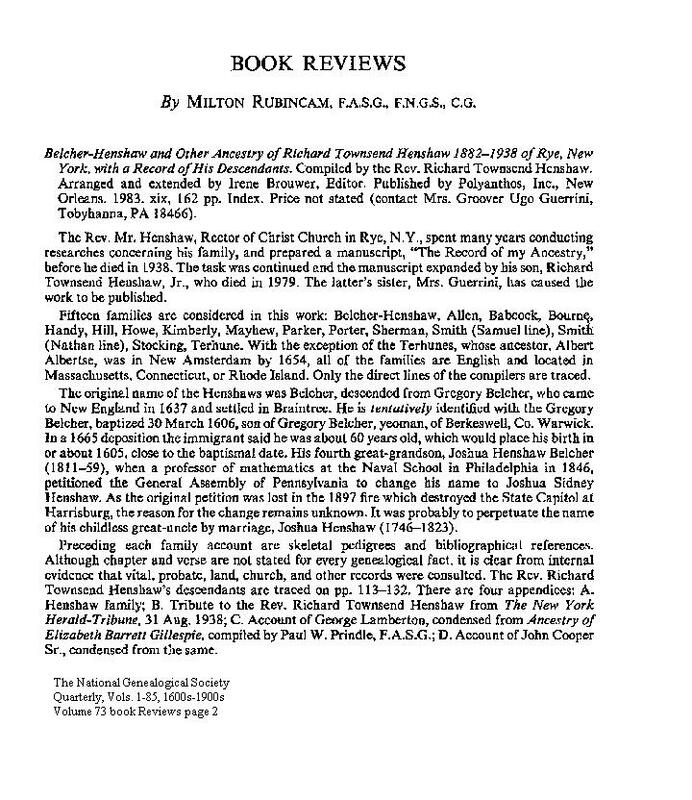 "Encyclopedia of American Biography"; http://www.ancestry.com.